We've never quite recovered from the closure of Chinatown's Cafe Joy. It left a gaping Indonesia shaped hole in our hearts. 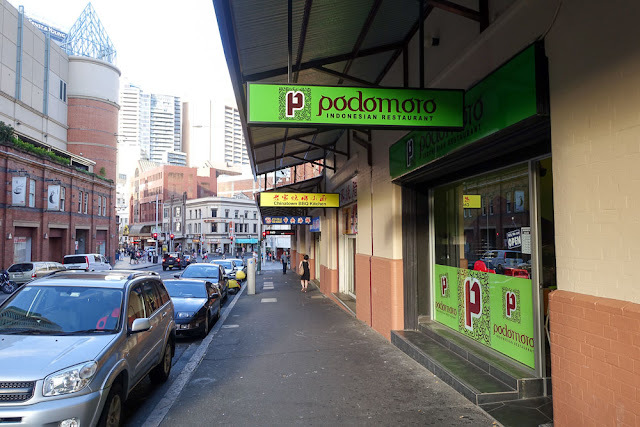 Podomoro to the rescue - around the corner and a couple of years later - it's every bit of the Kingsford-in-Chinatown resto we were hoping for. 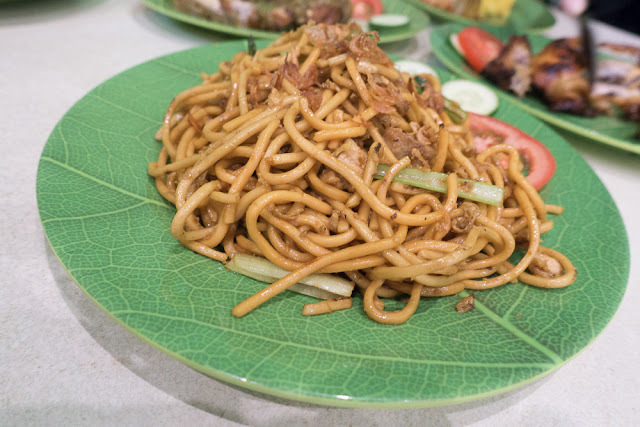 The nearby Lestari is also a cracker for a more Chinese leaning Indo feed, and of course there's the ever good and reliable Pondok Selera(s) in Eating World and Dixon House. 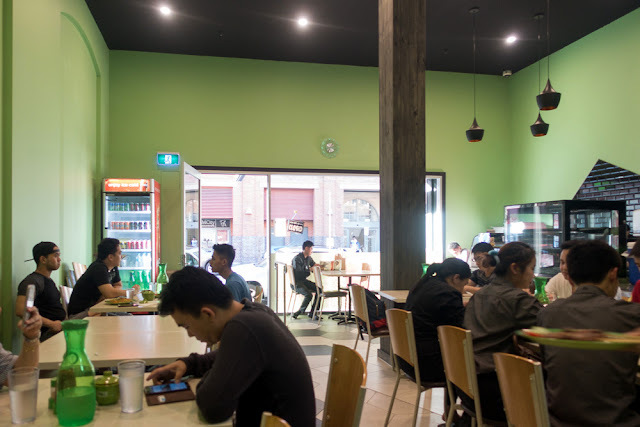 And there's the brilliant Willis Canteen if you fancy a walk to Ultimo, or the excellent Shalom more towards the city. 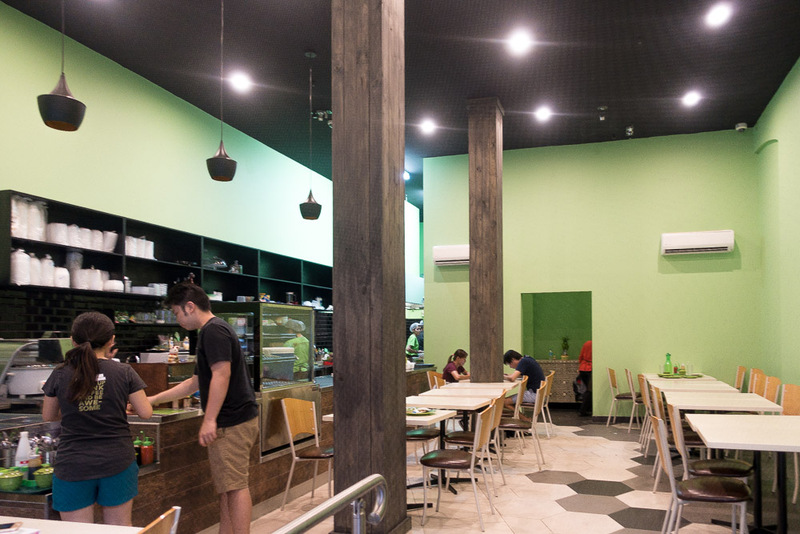 Oh, and there's Martabak Cafe on Harris Street which we never got around to posting, which is Alison's fault. But that's not enough Indonesian food for us. Too much Indo is never enough. We've always be hoping a classic Kingsford style student-y Indo joint would open in Chinatown, and finally we have one in Podomoro. We're a bit obsessed with it. Podomoro is quite busy and well run, hopefully it will be around a long time. The folks who run Podomoro must really like green. The banana leaf pattern and plain day glo green on the formica plates and pots of chilli matches the fern green walls. The staff wear green t-shirts. Even the chopsticks and small spoons for ladelling on extra belado sauce are bright green. The simple set up includes a write your own menu system. A piece of paper with your table number on it and a pen are provided for you to fill in your order. Take it up to the counter and the order is in. We love this, it means there's no problem with misheard menu items and stuff is less likely to not turn up. 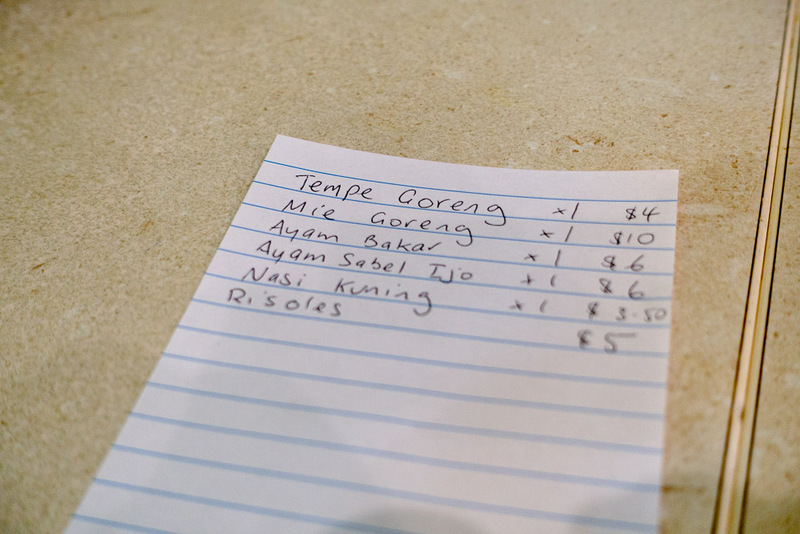 Even if you spell sambal incorrectly, you'll still get the right order. Tempe Goreng ($3). 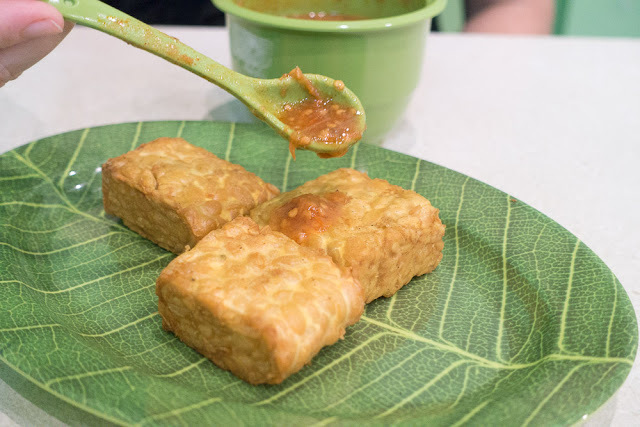 Deep fried tempe (bean cake) makes a good crunchy starter. Although it's easy to find and fry up at home it's just never the same as done in a store. The crunch of the soy beans outside and the creamier inside filling is always great. 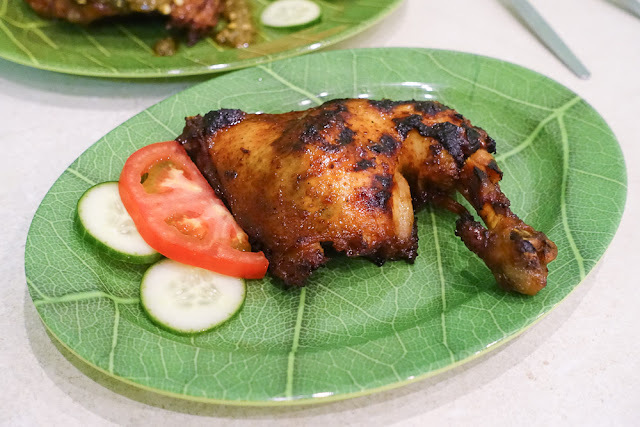 Ayam Bakar ($6). This is one of our favourite ways to eat chicken, the grilled skin is slightly charred and the meat inside tender. A good version on par with Ayam Goreng 99 in Kingsford [hmmm, nobody beats Ayam Goreng 99]. Ayam Sambel Ijo ($6). This chicken is served a little differently to the usual grill with sweet soy and red chilli options. 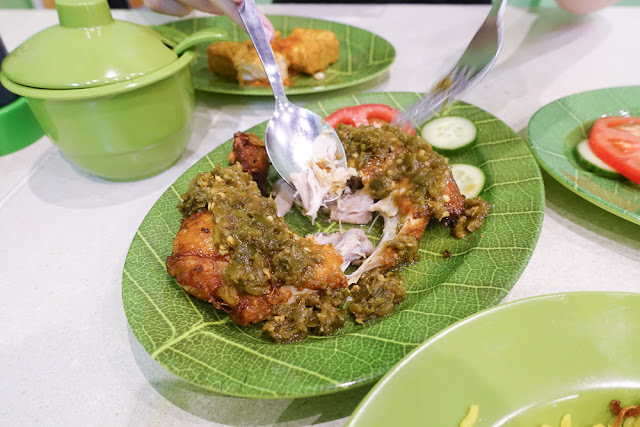 This dishes covers grilled chicken in a green chilli sambal and the result is a spicy green wonder. The chicken falls apart under your fork while the green chilli is a contrast to the usual red sauces. Mie Goreng ($10). Sometimes you just want a plate of fried noodles, and the serving here scratches that itch nicely. Not too covered in kecap manis, you can add more and add extra chilli if you want to crank up the heat. Risoles, $5 for two pieces. Shawn's eyes lit up when he saw risoles on the menu, he wants to write a book on rissoles of the world. 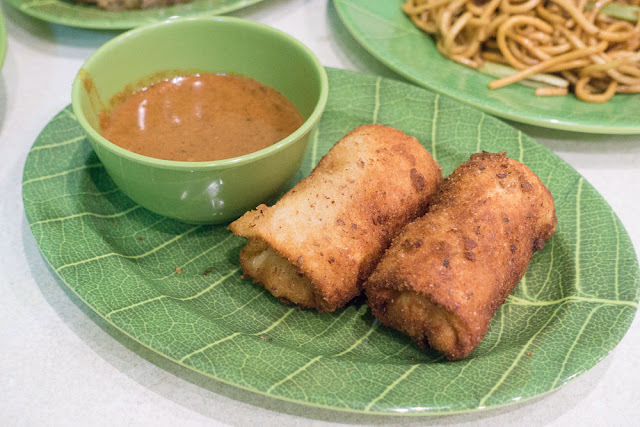 These were more like fried lumpia or soft spring rolls filled with mince and vegetables. The peanut sauce served with them was dunkity good. 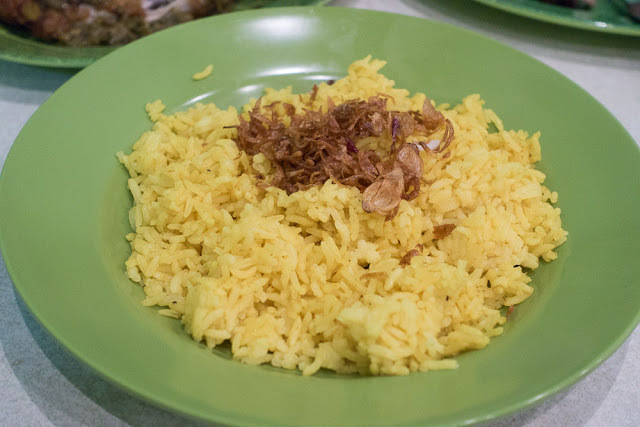 Nasi Kuning, $3.50. Coconut and turmeric flavoured rice. 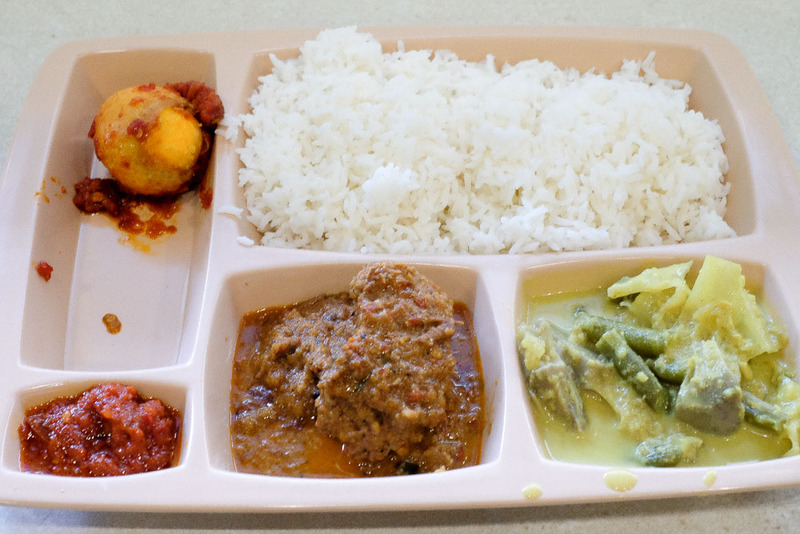 Gives you more flavour punch than a standard nasi putih (plain steamed rice). And it looks purdy as well. You don't always have to order off the menu. Lunchtime there's a bain-marie-of-love going for $10 for three selections. 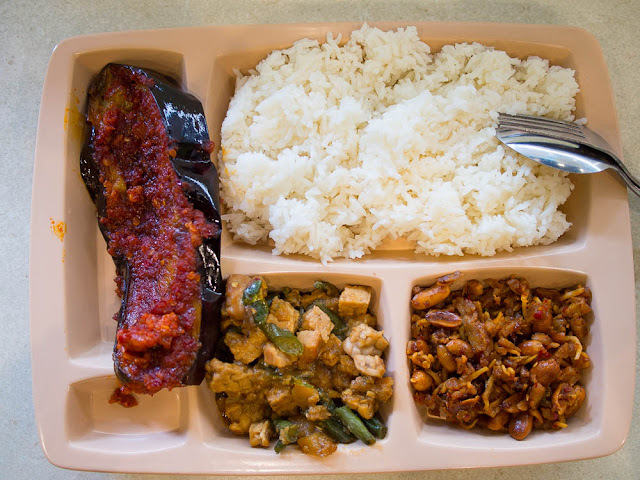 This time we go for belado (chili) eggplant, a tempeh mix and our old favourite, ikan bilis (little dried fishies and peanuts). Another crack at the bainmarie delivers a chili egg, a super tender beef rendang and greens. We've been getting in just before the lunch rush to get this food at it's freshest, though it still looks pretty good later in the afternoon. 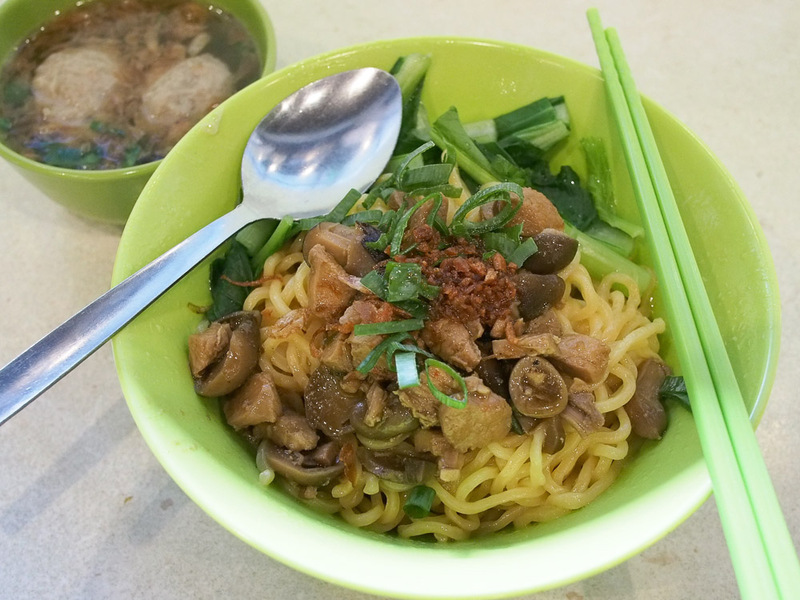 Mie Ayam Baso ($10). The classic street dish of chicken flavoured noodles topped with little bitties of chicken and mushrooms, with soup on the side. It comes with either baso (meatballs) or pangsit (wonton, usually deep fried'n'crispy). A tough choice. This is a great dish that's never as good as the first one we tried on the streets of Jakarta, and never will be. Soto Betawi, $9. The soup base for soto betawi is coconut and spices, which gives this a richer and thicker broth. This is a soup from Jakarta filled with beef pieces and beef tripe, potato, sprinkled with fried garlic and scattered with crackers. There are no noodles with this soup, so order a side of rice ($3) if you need some more fill. One of our reader folks reckons this is the best soto betawi in town. 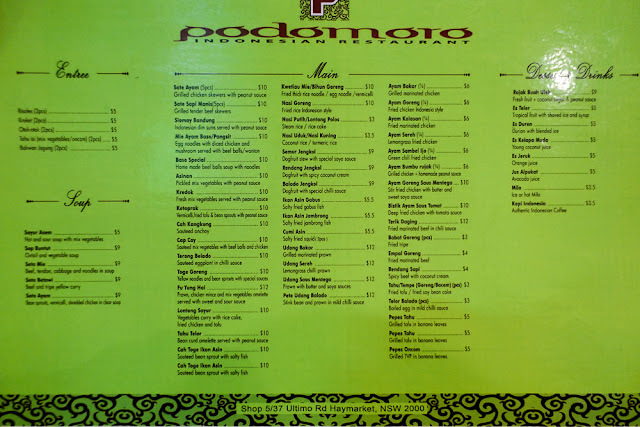 Podomoro menu - click to enlarge. Podomoro is at 5/37 Ultimo Rd, Haymarket. Ph: 02 8065 5083. Closed Mondays. Thanks for the pic, now I know where it is. I will add that to the list of places to eat with Shamrock. Nit: That should be "soto betawi" (Batavia soup), "Betawi" being the Indonesian version of Jakarta's original Dutch name, Batavia. Thanks for the correction, we've fixed it up. You are right... no one beats 99 with that sunny side and epic sambal .. still looks pretty delish tho! Permanently closed according to google. Phone rings out. Yep, I really miss this place, went there many times. Sukothai, Thailand - Bring a Plate.